Kunal Shah – the founder of Freecharge which was acquired by Snapdeal in 2015 for $400 million is now back with a new bet in the world of credit cards. About his new venture CRED, Kunal Shah says its “a platform to celebrate and reward the most creditworthy people of India”. Why CRED is a must have App? CRED is an app that allows you to earn “CRED coins” for paying your credit card bills. These points can then be redeemed for various premium lifestyle products & services. Apart from this primary benefit, it also has options to track your expenses, notify due dates, etc. CRED aims to reward the most creditworthy (Credit score > 750) people of India thereby creating a community of trustworthy customers. CRED pulls your Experian/Crif score at the moment, while CIBIL score may show up in future. It’s very simple and the entire process hardly takes less than a minute. Boom!! All your cards now gets displayed. CRED has done the integration with Credit Bureaus like Experian to make this is possible. Now you have to verify your card to add them to the app by filling the masked numbers of the card. CRED verifies your card instantly and that’s it. You shall now pay your bills and get reward points equal to the bill amount paid. In the backend, while you’re adding a new card, CRED verifies your credit card by depositing Rs.1 through IMPS/UPI. This reflects instantly on some cards while other cards (like AMEX) take upto ~1 working day. Security: As the founder of CRED App had prior experience in handling millions of users on Freecharge, its safe to assume that the app is completely secure. Privacy: The app has an option to allow email access for reading your statements. If you feel this is a privacy issue as you’ll have other personal emails, consider using a separate email ac for linking with Cred. Or, if you can go through your statements line by line, you may ignore the feature. Payments: Its safe to make bill payments at-least 1 week ahead as you can’t be sure what’s coming tomorrow. Just incase if it gets delayed more than 3 biz days, get in touch with CRED. Apart from that, never worry about the money, its always safe. The UI/UX of the app is one of the best that i’ve seen recently. As soon as i installed the app & verified my mobile number, i got 822 Points which is equal to my Experian credit score. Yes, you can get your credit score too with this app. When IMPS/UPI rails are down, it will be processed via NEFT. The most important factor whenever we deal with points is its value. Here its totally dynamic as it depends on what offer the merchants can afford to give. Premium merchants have rolled out exclusive offers for CRED members to generate brand trials and virality amongst these customers..
Apart from that, one of my best redemption was 5000 points for Rs.1000 Voucher from bombayshavingcompany.com. This gives amazing 20% value. I quickly ordered few items costing Rs.980 to make effective use of the voucher. It asks to pay Rs.88 (tax) to complete the order. That’s huge returns. Now if that sounds unbelievable, You may pinch yourself to verify that you’re not dreaming. lol. Here’s a quick look into my earnings & redemptions so far! Some of the merchants available for redemption at the moment are: ixigo, bookmyshow, cult.fit, bombayshavingcompany, bombayshirtcompany, bodycraft, four fountains spa, etc. Note that some of the vouchers can be redeemed only once while others can be redeemed multiple times as well. If you pay with a debit card, you get additional Reward points there too. You become part of a premium community that gives access to unique products/services. And yes, apart from that, some may find their transaction tracking features quite useful too. Cred is currently in the beta phase, yet you can experience most of the features now before it even goes live by year end. Use below links to download the app. Even though we’ve apps (like Paytm) to pay credit card bills, there has been limits to it in various aspects and almost none of them gave a premium feel nor rewards. CRED solves it all with a refreshing look, simple & easy to use interface, rewards system and on top of it – a premium community which is an added advantage to get access to some cool redemption options just as above. Have you tried CRED? Feel free to share your experiences in the comments below. I redeemed the 1K bombay shaving company voucher as well 🙂 . I hope they add more reward options. Kill the bill gave me 15/- and 11/- so not that much. Cool. Got a Rs.500 bookmyshow voucher too shortly after. They seem to have good set of redemption partners lined up. Does it work with Yes Bank, Standard chartered cards? Damn man, how did I miss it? Lol. My score came 865 on Experian. Got accepted. One stop destination to pay all my credit card bills. What about the reward points earn on spends? Do they get effected? in testflight app for iphone asking for invitation code to redeem so which code to enter? Just open the link (on mobile) after installing testflight. You should be able to download. Still not able to open without code so please help.thanks in advance. please help as i have installed testflight on my iphone but asking for invitation code to redeem so where from i may get same to proceed. Ignore it. The link should now take you directly to appstore. Rs.700 is great! Yes, it should show up in a day. Worst case, you’ll get the funds refunded. For us, its all about reward points. For them, i believe they’re creating a community of people with higher credit scores. So they can allow premium brands to gives us trials, sort of! In long run they may come up with new offerings, like their own credit card. Who knows! I paid 65K on my credit card bills and received 65K Cred coins, how to convert them into Rs or encash it. You can’t convert into Rupees. You can try your luck with #killthebill in which if you burn some 30K coins, if you get lucky you may get some 300, 400 rupees. If you want more value, use it for vouchers redemption in their app. Wow. Another amazing money maker treasure you found. Thanks a ton Siddharth. Keep up the good work. Wow cant imagine this can be there…will download now and see…thanks for updating us. No code. Just re-open the link (on mobile) after installing testflight. You should be able to download. Lightning fast posting of this review. Yesterday launched n today Reviewed !!! I also joined Cred on launch day. Have collected 35K cred coins. But my personal redemption choice is 5000 inr ixigo promo code on burning 2lacs coins ( valid for 93 more days). I hope they don’t preclose this offer. is it transferrable? I have already made new year plans but wanted to gift this to someone else. Just a correction, don’t think there is any limit on number of Credit Cards which one can add; I have got 12 verified without issues. I am unable to add more than 10 cards. What I understand from their FAQ is if the cards are pre-loaded the limit does not apply. But, if we add them, then 10 is the limit for now. Yes Hari. In my case already had 10 cards pre-loaded and then added 2 more and worked fine. 1. Can i pay any Credit Card bill with Debit Card via Cred app? 2. If first is yes then can i pay my Amex CC bill with HDFC debit card via CRED App? 3. If second is yes then can i get 1% cashback to my HDFC Debit Card as HDFC Debit Card offers 1% cashback on spends with some HDFC Debit Cards, I mean does paying Credit Card bill payment considered valid merchant code for 1% cashback? HDFC Platinum debit card doesn’t give 1% cashback blindly on all spends. There are restrictions. Effective 15th May’17 you will get 1 CashBack point on every Rs. 100 spent on Telecom, Utilities. No cashback points for all other categories apart from the ones above. That’s correct. i can confirm that no points being added on HDFC preferred debit card. Yet, Jet debit card should still give JPMiles. You should do another article or add to this article about which Debit Card gives points while paying through Cred app, So people can double dip and earn points while spending and when paying back. I paid using YES FIRST World Debit Card and I can confirm that I got points based on their usual criteria (which isn’t great) but this is something which I wasn’t getting earlier while paying CC bills so I will take it. Just redeemed 2 kill the bill cards of 1000 coins each to receive instant CC credit of inr 48. So if i spend on SC Ultimate card, i get 3.3% reward rate and i can pay SC CC bill using HDFC Debit card and get 1% more and i will also be rewarded by CRED app, So basically i am getting close to 5% return on my spends. Yes, even more than that at times if the offer is too good. I don’t think there are rewards for using your HDFC debit card here. Did you get any? Now, now! The Experian score checked by me was 780 while the one displayed by CRED App was 852! What’s going on? Is the “exclusivity” stamp just an eyewash? Also, the email access to read “only credit card statements” is like knowingly opening Pandora’s box of troubles and compromising your financial and personal life! Just my two cents. Yes, I agree! It’s trap, its complete lie, they don’t need access to email to credit card statements, they are pulling this information from the credit card. Initially, I gave access than then read their privacy statements, but later reverted the access. Basically giving email access to them, they can easily read gmail emails, So your Privacy is at stake! I also had the same thought. When they can pull out all cards through mobile number then why they need email access. As of now i have given access. 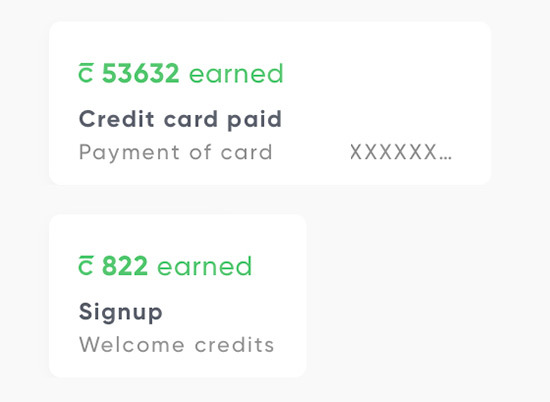 If you click manage card one can see segregated expenses for travel, utility, food etc… wonder they will sell this pattern and we will get offers from tele marketers regarding these. This is the only way they can make money i guess. These days data is everything. One can see how crownit has also changed its model to surveys, uploading pics of detergents, soaps, etc you use. There are a lot of ways to make money with data, I completely agree with you. But they do get a commission from Credit Card companies for the payment! They are not doing it for free! CC companies don’t pay AFAIK, or maybe they would, if this makes any sense for banks! They may probably use the data to create services on top of it. Thanks. Just installed and after reading this, I Uninstalled. Why so ? What compromise did u forsee ? How did you manage to revoke the permission? Just like indialends shows cibil score of over 850, while in actual it’s just 720 of my colleague. I unable to pay my credit card bill since I installed this app. Do they consider Cred as payment or as credit in statement? I’m asking as Yes Bank reverses/ reduces reward points for credits other than payments (like transaction reversal or VAT refund when you shop abroad). Its a typical IMPS/UPI/NEFT payment, so they wont reverse points. Did anyone try Yes Bank and get instant credit? No. For Yes bank you will need to wait for one working day. I had made some payments last week. whatever we are getting is good. We never used to get this before. Thanks Sid! I have registered. The name needs to same, if there is any spelling mistake app would not recognize you. Till now I was aware of the CIBIL credit rating agency, just learned abt Experian/Crif. Looks like Experian score is equivalent CIBIL as both my scores are almost the same. Crif score, on the other hand, is way lower, not sure why! I have around CC payment to do, you mentioned its better to pay from Debit Card for additional benefits? What are those? There are 3 major consumer credit rating agencies – Experian, CIBIL and CRIF along with Equifax. They all have different algorithms although broadly based on same credit parameters but with different weightage. And scores are in the order of Exp>CIBIL>CRIF ; but these scores should not be compared against one another. Only CIBIL can be compared with another CIBIL and likewise. Am I the only one getting the message that you are waitlisted on registering. Seems your CIBIL score is low. They are waitlisting folks with less than 800 CIBIL score. AFAIK, they aren’t checking CIBIL for now. They’re deciding mostly on experian. Thanks Datta. The last I checked my score was 764. Thank for the info. This can be useful for the future credit card payments. Yesterday only i paid approx. 80K for my HDFC and SBI credit cards. Now is a very good time to review the best debit card for 2018 and beyond. What cards are you folks using? I’ve a SBI Signature Debit card with no annual fee and 0.75% reward rate. The value of the points is cash equivalent, that is, Rs 0.25 per point. I can choose to redeem pre paid cash gift card, redeem by points at POS at Max, Lifestyle, Reliance Trends, etc. I can also choose to do mobile or D2H recharge, book cinema ticket, flight, bus etc. I gift a annual “free” shopping trip to my wife at Reliance Trends/Max/Lifestyle. With CRED, I think it will become a bi-annual shopping trip! The good thing is I get this card without paying any annual fee and without any requirement for savings balance. But Rs 25 Lakh NRV (demat, MF, life insurance, home loan or salary over 2 Lakh/month) is required. I see that Axis Priority Debit card is the best but they require an savings account balance of 2 Lakh and also we don’t know when they will stop giving the 10% cashback offer. SBI Signature debit card has no reward rate limitations and 0.75% is normal reward rate and not special limited period offer. I would request Sid to do a review of Debit Cards too. Have you claimed 10% cash back from Axis Priority Debit card? If yes, can you please tell me how to claim it as I have made over 1 lakh online payment using Axis Priority Debit card. Axis priority debit card. 10% cashback upto 2,500 inr per quarter. I have it….never used the card till date except ATM. Its a binus for me now…. If I say this app is awesome ,its an understatement ! How long this app is in use?great one. Because of you we earned lot through credit cards and now because of you we are going to earn good amount in paying the credit card bill also. I wonder whats next in the pipeline ? Yesterday night around 10 pm I paid Citibank CC due but its still not reflecting. Its out since past 1 week and it went to public on 26th Nov.
Mostly financial products like loans, credit cards will be pushed to the customers, as they are going to have high credit numbers. Which will be the best Debit Card to pay CC bills on the Cred App? I paid using my Indusind Debit card Hi5 offer which gives a 500 voucher for doing 5 transactions worth Rs 1000 each. Thats a 10% reward. My Experian score is 707 and my CIBIL score is 777. I got a message saying you are wait listed. So definitely they didn’t consider the CIBIL score. It is good that i got a credit card for wife couple of years back, we use it once in a while and her credit score is 822. Happily using it with her account. Paying with debit card seems to take a while (2-3 days or more) to reflect to the credit card. Any idea on when it usually reflects? I keyed in the details and now the application is under processing. Not sure how long it will take. Has anyone faced this? Apparently they don’t have my credit record with Experian. The app failed, and then I tried to fetch the record myself through Experian, and there was none. Yes, one of my friend have this issue too as he’s just ~3 months old to credit system. But your’s should be different case. Try contacting experian. Now it worked. I am not sure why it was failing. My Experian score is 850, so got that many points (my wife’s is 861 and she has far fewer CCs than I have). By the way I was getting a travel voucher of Rs 600 for 10 creds, which is cool. Installed the App…but still in doubt to share e-mail access since all our personal mails including financial one are at stake…Sid could you please elaborate on this since you had also given access of your Primary e-mail where all your cc bill statement generates…. I haven’t given access to email as i don’t need those features, at least for now. But I really don’t have the time to pay credit card bill at a particular time. So, I schedule payment using NEFT. Can we pre schedule payments even while using this app! NOTE: Be sure to pay the CC bill’s 2-3 days prior to the billing date otherwise there can be issues. My payment for Diners Clubmiles has gotten stuck since yesterday and today is the bill date and now the dam HDFC netbanking is also down. Where as my AXIS Select bill was Credited within an hour yesterday itself. So this might be growing pains but certainly instant accreditation even with HDFC/ICICI/Etc maybe patchy in the initial days. As for the late fee charges I might get charged talking to HDFC customer care with a preferred status always gets them waved off. Hi Ajai, I am a team member at CRED. Can you please drop me a message at rahul@cred.club, or contact our support team from the app directly, and we will get this checked immediately. Nice to see you being proactive here. Do let us know about updates from your products. Will be adding paytm / wallets as payment option? As a team member for CRED would like to know why would you want access to email accounts? Havent seen this request from any of the apps till date. It can be a deal breaker to download the app. Thankyou Rahul for the suggestion but it has mostly been taken care off. I received a refund of the amount and have deposited the bill with net banking. The only remaining thing is to get a waver for the late payment which I will handle. My payment is stuck since 3 days, I made payment on 2nd April and my card due date was 4th. Could you please help, I have already reached out to the customer support through the app. The Bombay Shaving Co gift voucher is now revised to Rs 750 for the same number of points. They are showing their true colours now? I don’t trust them and have not given email access nor will give even if their is a bait. Yes, i noticed that. Maybe too many availed it. P.S. Remember, we’re getting this just for paying bills. Meaning, something is better than nothing! The ixigo 5K voucher was initially for 1.5 lakh points and a day later got increased to 2 lakh points, so yes they are revising these constantly. They are storing debit card details along with my CVV and expiry date. Yeah, I figured that out too. RIP if Cred database is hacked! Paid my HDFC and yesbank card bill. Hdfc was instant while yesbank still payment is not reflecting. Got Rs 203 for HDFC bill payment. My Experian score is 865 while crif is 758. Shocked to see good score on Experian as no bank is reporting enquires made. I can’t Ixigo anymore after I redeemed 1 of it. How were you able to get 3 vouchers? I redeemed 1 Ixigo voucher and cant redeem further, how you got 3 vouchers and you mentioned 3 different account,for the same mobile number you created 3 different accounts?is that possible? This limitation by cred is frustrating that you can redeem a voucher only once . They all got credited. I don’t think they’re limiting any offer location wise. Or do they? Offer not applicable for TN. Read in their T&C. On another note, it seems you can only purchase the rewards once. I got a BSC 1000 voucher and an UrbanClap voucher (5000 points -> 1000 Rs./-) however I still have balance points I can potentially burn, but can’t see these 2 vouchers anymore under rewards section. Paid Rs 5000 for ICICI CC bill just to test the things…payment credited instantly…and earned Rs 1000 as additional credit! Rs. 1000 as additional credit? Yes , kill the bill! Tried out the app. Had some UI problems while doing sign up like next button not appearing after entering phone number. But things were smooth after retrying. It could map my phone number to fetch HDFC, Amex and SBI card but not Yes bank one which I later added manually. It showed my experian score as 827 and Cref 799. Does anyone know what’s the difference between the way two are calculated ? Not sure why cref is lower. Last time I checked my CIBIL score, it was 820. Ive noticed for the Cred Expert feature one can only add gmail account. I get all my cc statements in my outlook account. I probably would not want to give the app access to my outlook anyways but Im thinking if I simply forward the statement related mails to a throwaway gmail account would that CRED Expert feature still work? Yes, that should work. Make sure to do auto forwarding than manual. I wonder, why they need email access for card statements? Suppose, they got access to email, now how they are going to access those statements? Credit card statements are always came as encrypted with password. And Amex never sent statements in email as attachment. They just sent a notification. Auto forward is not working.. I’ve tried already..
Stmt received.. But not detected by cred..
Then liked the actual account & it read instantly.. Many CC holder including me here reluctant to give access our email account to Cred. Sanket’s idea of a separate email account is really good. If it works we will able to share statements without compromising our personal data. I think Cred should come with an alternative solution otherwise people may not use Cred as expected. Dear Sid, its always a pleasure to read articles like these. Which debit card would you and Dr Roy suggest to pay these bill to get the maximum value. +1 about the most rewarding debit card list. I too have upgraded from Preferred platinum debit card to a Jetprivlage debit card “FYF :)” specially for this reason. I think he meant “First year free” buy FYF. Leant from HDFC website. How safe is this app? Is email access required for the app to work? Thank Siddharth for the new find. I installed it and was able to access the map. I updated the app. Later, while logging in, it is asking for CRED Secure password. I have not given any password. Does anyone experience the same problem ? Hi Ramesh, it should be the password you routinely use to unlock your phone. Thanks for the reply. I normally use a pattern to unlock the phone but here it is asking for a numeric password. I have escalated the issue to CRED support. Fantastic concept of rewards against credit card bill payment. However, this makes me wonder how these guys would be earning. Also just my mobile number is enough to get my credit card details? This scares me. What are the credit card score ranges for Experian and Crif? It’s weird that in the app my Experian score shows 900 and Crif 770. Are these even real scores? Has anyone tried the redemption of recliner on Furlenco or 10k on urban ladder? What are the terms and conditions of these redemptions? I tried this app. I have entered my name and phone number initially. But it says i am ‘wait-listed’. I will be informed if there are any slots to add me. What is this? i don’t understand. What slots they need. Is it restricted membership kind of app. Somebody through some light on this issue. Thank you Sid. I have many such apps but didn’t take risk to give the credit card details.. As i am following you from long time with trustworthiness of you i installed app. And got 896 points, so it seems i have good credit score. i guess, taxes have to be paid by us. Better you add one face cream/ face wash as well and use my Referral code along with the gift voucher ‘PK3IKA’ to get extra Rs. 200 off. Now use the welcome voucher from Cred and Referral code mentioned above. Basically it is giving discount on MRP and charging the taxes. I applied for CRED and it shows me in waiting list… how much time will it take to move me from waiting list to a registered user. Can you please confirm if there is any expiry to these Cred points? So that we can plan to accumulate and use to get max benefit appropriately. Hi Priyank, It’s 90 Days from Date of Credit. Thanks to introduce us to this new App. I have installed and joined. My experian score is showing NA but CRIF is 805. I have got 885 Cred point and Rs. 600 discount voucher offer on Ixigo. 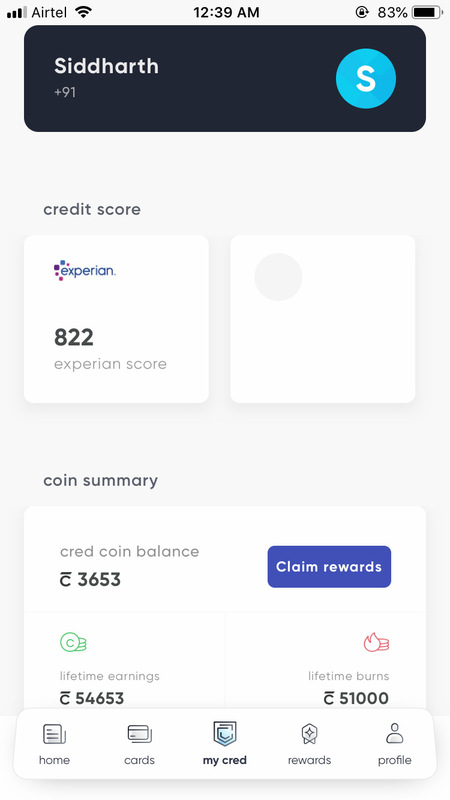 It would be interesting to see how dynamic they are with regards to this Credit Score part , as it is based on historical creditworthiness ; anybody with 800 score on Experian can also default in future . What CRED needs to do is periodically check for the scores of registered users / wait-listed users and be dynamic . i have Axis priority debit card. It has an offer of 10% cashback upto Rs.2500 per quartre if one spends above Rs.20000 online except wallet payments. I have never availed this offer though as i am a credit card guy. Lets see if i get the cash back. Thanks Sid for updating us on this wonderful app. Installed the app. My Experian score is 820. Paid around 4.5 Lacs of pending bill. Redeemed for 2 ixigo 5k voucher and cash of about 234 rs. I redeemed only one ixigo voucher for 5k then I am not seeing ixigo option, how were you able to get 2 vouchers and when you did the redemptiom ? does a ny axis or hdfc debit card give cahsback points on paying credit card bills on this app? I will try out this App. But please be aware of providing permissions to your emails. It is really scary to think of how that can be misused. No point in sacrificing privacy and security just for a little convenience. Got 889 Points as initial Setup reward equivalent to my Experian Score redeemed 600 ixigo voucher for 10Points 😁, didn’t enable Email access, have another doubt in my mind , for my SBI & Citi card it asked for only 6 digits but for ICICI & Yes Bank it asks for entire 16 digits , why is it so? Did anyone benefit by paying thru debit card, i try on HDFC and YES debit card, no points. There are people who dont want to buy credit cards at all and then there are some people who want to enjoy the benefits of using a cc. Same product different people different perspectives. A credit card number without exp date and CVV is not harmful and moreover even if the card number getting misused you can raise a complaint with the CC company and they would reverse the transaction as all the CC transactions are usually approved and posted on the card in t+2 days. If we are getting the rewards at a rate which is more than 5%, i think it is worth the risk. Credit card number without expiry date and OTP/secure password are useless to them, nobody can misuse the card. Even if they do, as mentioned in the previous response you can raise a dispute with bank and get them to reverse the charges. I was amazed to see your last line. You have never used credit card offers on Amazone? By postpaid, I believe you mean use COD always. I would say you are being overcautious here. With 2FA, India issued credit cards are one of the most secure ones. Interesting app. Went for the bombay shaving company gift card of Rs 750. It seems a trial based offer and now that i availed it, its no longer there. Will go for the other ones as well . Hey! I wanted to know that the payment i will be making will be reflected on what name in my debit account? Like the app or the Credit Card Bank? Those who have given access to email with a dilema, can delink the access with a built in feature of cred app. This can be done through profile-settings- delink email. I have done this . This is some next level insanity! Thanks a lot Sid for sharing this!!! I installed it a couple of days back. Redeemed and used vouchers of Bombay Shaving Company (750), Urban Clap (500), The Moms Co. (500), The Mans Company (1000; no shipping charge :-D), BMS (250). When I checked yesterday, saw that they had 1 more voucher of Bombay Shaving Co., (1000) and Urban Clap (1000). Redeemed and used them as well. That’s not it. Got 2 x Ixigo vouchers (600+1000), Bombay Shirt (1000) and DriveU (500). So got items/services worth 5000 for just paying my CC bill worth 50K !!!!! That’s 10% value back already and yet to redeem 6% more. Overall 16% value back. MIND BLOWN!!! I hope Jet Airways doesn’t go out of business as I’m planing to upgrade my HDFC Platinum Debit card to Jet Airways one. PS: I didn’t give them email permissions and never will. Thats cool. 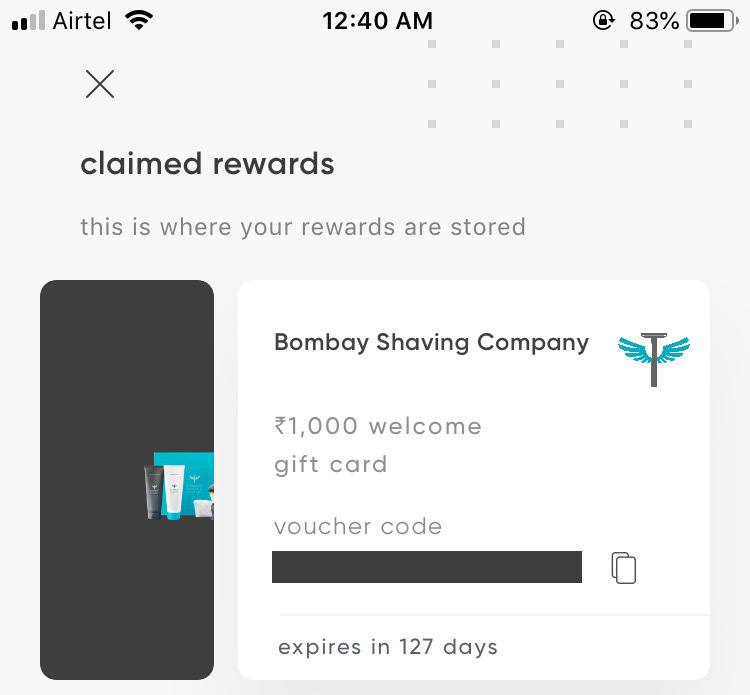 I didnt find that 1k bombay shaving voucher in the app. Already availed the 750 one. Lets hope it pop up soon for me as well. Excellent find Sid…. thanks. My Diners Clubmiles Credit Card Limit was increased by a mere Rs. 23,000 /- after sending a copy of my Indusind Bank Legend Credit Card at their Chennai address, whose limit was recently increased to Rs. 7.25 lakhs. Struggling to get Rs. 5 Lakhs Limit & upgrade to Black as well. Got 445 jp miles today for paying 33445/- worth card bill through Jet HDFC debit card on 27 november. This is strange no one talking about privacy ! Does anyone have an idea, under which merchant category/ code does Cred app payment (PAYUDREAMPLUG) fall under? Reason for asking this – we can maximise our benefits further by using appropriate debit card. It’s better to redeem the points ASAP as they have started devaluing the redemption. Example: BSC now gives a voucher of 750 instead of 1000. Ixigo Voucher of Rs 5000 gone. Only Rs 1000 and Rs 600 is seen now. Nope. I still see the ixigo voucher of 5000 Rupees. May be if you have redeemed the 5000 rupees voucher already, it may not show up. Ixigo voucher of 5k added again on 200k CRED points. Wanted to know the validity of CRED points so dropped them a message from the App. Was pleased to get a call back from customer executive, who had answers to all my queries, was forthcoming on my suggestions to show validity in the app itself for expiry of points. Exiry is FIFO method. Also, the conversation was very much on the lines of Amex Customer support- knowledgeable, warmth, open to suggestions! Hope they have similar executives which would be an enriching experience to use the App. Has anyone used bookmyshow voucher? I am getting an error that the coupon code is not activated. If you trying it in the “Credit Voucher” section, it won’t work. Instead you should click “Unlock offers or Apply Promocodes”-> “offer codes” and then apply the voucher there. Recd 445 jp miles on paying via jet hdfc debit card. I am giving away The Man Company coupon worth 10,000 CRED points which will get you Rs. 1000 discount on their website, but you will need to spend 1,750 to redeem this coupon. I bought this by mistake and didn’t knew there is a condition on this, hence giving away the coupon so that someone who might actually be using their products may get this discount. Guys – need to know if any bank debit cards are giving reward points on payments through CRED. I tried payment using my Citi Gold debit card, but they are not giving points on transactions where it says CRED or Dreamplug. On a couple of smaller transactions, where the name was payu, I got points but now all transactions come as CRED. How about ICICI, HDFC etc? CRED coins will expire automatically after a lapse of 90 days from the date of allotment. I believe the best payment option is via CitiBank Priority World Debit Card, gives 1.33% cash reward. Citibank has a referral program as well, if interested get in touch with me. Would be interested for sure. Though I guess there would be some high min balance requirements? Are you getting points for CitiBank Priority Debit Card? Read the comments here that Citi Gold debit card does not get any points. Can you tell more about the referral program as well? I got points on CITI debit card. You will get points in next statement. With your help and introduction to cred i was able to pay my bills and redeem Rs.5000/- ixigo flight ticket voucher. Ps. Because of you I now have 7 credit cards and miles to Travel world. I’m getting JP miles for paying through Jet HDFC Debit card. Me too. already got 445 & 319 jp miles in 2 shots so far via this Jet HDFC debit card. Hope they don’t stop rewarding jp miles here anyime soon. It takes 40 working days for JP miles to reflect in JP account for spends on HDFC Jet Debit card. How are you able to check so early? Via Jet Privilege app I see jp miles posted in approx 10-15 days. The only app I can find on the Play store is JetAirway which does have a Jet Privilege section but it does not show anything till now “been 20 days after transactions”. Do guide as to where to see/download the app. I don’t think there’s any jetprivilege app. Can you share some more details of what you’re talking about? Sorry for mistake. I was actually talking about Jet Airways app. On selecting jet privilege option under app, further select activity details. On this page I see the miles posted on 02.12.18 for cc payment done on 27.11.18. My debit card is Jet Mastercard variant. Thats pretty fast. Nope. The payment made on 9th December, I’m seeing today on 19th December (don’t know when they posted it) with value date 14th December. I suggest you use DCB debit card (No, not dinner debit card). But if I’ve seen a debit card worth using here. It’s this. It’s from DCB Bank (or Development Credit Bank) and I suggest you take the family account. Rs. 1 lac min. balance to be maintained accross upto 5 savings account. 1.6% cashback on debit card spends up to 2,000 pm. Max 20k annually. This means 20k x 5 accounts = 1L annually just for using a debit card. If you don’t want family accounts you can get the same benefit (20k) at 50k min. balance as well (elite account). Sid, I believe they have branches in Salem as well. Do check it and let me know what you think. DCB Elite savings ac- minimum AQB 25K only. It may vary from place to place or branch to branch. Great find Aman. Yet, i’m not really interested in adding more accounts as managing existing accounts itself is taking quite a lot of time these days. Can you confirm, if you got cashback for using it in cred app? Cashback is given in the month after end of the quarter. Will let you know in Jan 2019. I’m fairly certain of getting it. Will be waiting for reply in jan. I have got just the interest credited to the bank account. Can you please let me know usually by what date will the bank credit the cashback? Did you get the cashback using the DCB card here? Seems like many people are waiting for your answer. Can you please confirm if the 1.6% cashback is applicable on making transactions using Net Banking and NOT Debit Card as well? No Cashback given by DCB bank in April for the quarter Jan to March? Any one is still getting the cashback? NO. It is valid ONLY on debit card spends of Elite Savings bank account. Not on Net banking. The redeemable rewards seem extremely dynamic. I saw the rs. 1000 Bombay shaving company voucher on one day. Next day i paid my bill and went to get it to find that there were no vouchers left!!?? Witnessing a lot of churn in the options available. Hoping to see the bsc voucher again soon though.. Thanks for the heads up, Vaibhav! so please if anybody can help. I have the same issue. Payment made via HDFC debit card towards HDFC credit card on December 14 is still not reflecting as a credit. Though it is supposed to be instant with HDFC/ICICI/AXIS/SBI, I see that it can take upto 2 working days (sat/sun is excluded) for payment to be credited and reflected in your account even for my ICICI and SBI card. I would suggest you to pay 3 days in advance for ICICI or pay directly using ICICI debit card. I don’t see how can it possibly be instant if you’re paying with a debit card, unless CRED gives you a short term loan. When you pay with debit card, it can take upto 7 days (usually 2-4) for CRED to get your money, they can then IMPS. I’m fairly certain for instant transfer you need to use net banking. Yes, CRED uses its funds from escrow to credit the user ac instantly. They actually get funds in ~3 days, even for net-banking payments. I use Citi debit card to pay and the payments are getting reflected next day for Amex. The amount in Citibank account is earmarked. Question is – will we get interest for this amount? Payment deducted but not credited to credit card. Poor support from customer care service. I don’t accept the statement of poor support from customer care service. When I faced an issue with payment, they were following up every day and keeping me posted on what is happening and resolved the issue as good as possible. Payment is taking 3 working days to reflect under card statement. Hold on to your horses! Sid, you have an Indusind Exclusive debit card. Have you tried paying with it. Are you getting 6X rewards with this card ? Yes. I can confirm that I got the points for my CRED payments. In total, maximum points that you can earn is 3000/card/month. I used that card and didn’t get 3k points; got 2.5k. Sent an email to Exclusive customer care. Awaiting reply! Hurray! 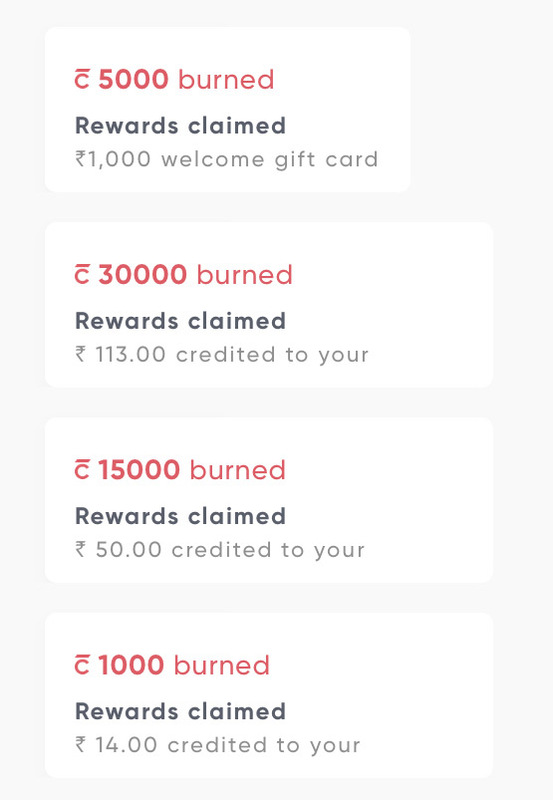 I got 1000 rupees cashback on burning 1000 points to my HDFC card. I just can’t believe this! I think the Voucher gone out of stock. It came back again today. I checked today and it was there. The moment I paid a bill and hit 200k coins it disappeared for me. Cool. Rs.236 is the max i’ve got so far in single redemption! i got 1000RS five times till now. thanks sid..im a big fan of u.. I got 1000/- just now, its refleting my reward history but didn’t receive the sms confirmation. Generally, I receive sms confirmation for all reward earn transaction. Any catch??? Dayum Dude! I got 150~ bucks only, each time! 150 in each transaction is quite good, I only get in range of 11-16 bucks in 95% transactions. While minimum is 7 and maximum is 48. More than 20 transactions. I am giving away the Voucher for website bhaane.com, If any body needs please use it. I got a MarQ 32″ LED TV for FREE with the new year offers using 10,000 CRED points. The LED is worth around 10,000 rupees! This was my best redemption ever with CRED. I run a home appliances showroom, where I will probably sell this LED for 10k cash. You are lucky, Shahil!! Enjoy your new year! Cred seems to be losing its charm. The app says new rewards everyday at 11 am but there are only the same old ones…. Wish they added new rewards which we can actually use. Not the current list of unusable vouchers. Urban ladder, Airbnb, UberEats, Freshmenu, Myntra, Stylecracker, Caratlane, Bombay shirt company, Flyrobe etc. All these & more aren’t of use to me. The only voucher that may be of actual use could be the Ixigo voucher which is limited to flights. You are right. I now use the CRED only for the Kill the Bill and for the fact that I can use my Debit Card (can earn points). I’ve a SBI Signature Debit card with 0.75% reward rate. I can tell that I definitely get points for CRED transactions. Are you referring to the one issued with Exclusif ac? I tried Yes Bank and SBI debit card, earned points on none. Which card gives points on Cred payments ? Yes First World debit card definitely gives points. I have confirmed it. Yes Bank Debit cards do earn points but it is extremely low with 0.125% reward rate. IndusInd Exclusive for sure is giving. So is SBI Gold. I made a credit card payment through ‘Kill the bill!’ option, the status saying failed, but amount got deducted from bank account and Today is the last due date for my credit card payment. Could you please help me on this, my Txn id: WDKQPV15Y7. Check with Cred Bhaskar. Only they can help you. Also, have you set up instant refunds? Useless vouchers now…..me and my friends used the blue tokai voucher. The cafe knew about it and redeemed it instantly for any coffee on menu. So saved around Rs250 for 2000 points. you can get a dineout gourmet passport voucher now. I made a payment on 31st Dec for 1.25 Lakh but my payment is not reflecting with Standard charted. Be aware. My ‘Kill the bill!’ credit for 3 transactions is also pending. I get elusive replies and all good vouchers are gone. Be aware for a small bait we should not end up paying late fee and penalty interest and taking a hit on our credit score. I have also paid 11k to my citi card and it got stuck. Now they are not reply to my emails. Just sending automated emails every time I raise ticket which is good for nothing. Now I am charged with LATE FEES. The 1.6% cashback from DCB Bank – Elite Savings account has been credited to my account today. If that ixigo 5000 does not come soon i will cash-in all the points in a few days. I have made a payment of 12k towards my hdfc bank credit card through cred app. tomorrow is the due date for the payment. How long will it take for the payment confirmation from hdfc? i dont want to pay any late fees. CRED Customer care has gone very bad now. Now there is no live chat and only email support. I raised a ticket on December 28, 2018 and I haven’t got any reply yet. I am just afraid to make bill payments going forward in this app. What if the payment is not credited and no body is responding to customer tickets like this? Last time when I had payment issue, Someone from CRED team was following up with me via Call and keeping me posted and I really liked such customer service. And now, it’s completely opposite. Getting poor day by day. Don’t know where it gonna end. But generally speaking, payments can never be a problem. Either it gets credited to card or gets refunded. Only problem could be “delay” at times. The “Delay” is the bigger problem for many of the people. I generally clear the dues at least 5 days before the due date but the problem is the frustration we get when no body responds to the tickets raised and no response even after a week. I’m also facing similar issue, but status shown as credited to bank. Raised ticket, not no response to now. For me it’s credit on third day, so issue is solved for payments done till now. For the raised support ticket got kind of template message, after 5 days saying revert to us if still issue persist. In order to avoid late payment charges, I have decided to make payment 4-5 days before due date if using CRED app, so that some kind of assurance will be there on receiving card payment before due date. Yes, their just ~1.5 month old and maybe usage volume of CRED app might be beyond their expectation, so internal technical issues due to huge volume bond to happen. But they can improve their support team in giving proper tentative dates by when they’ll come with resolution. I checked with CRED on this. They’re equipped well to handle high volume, but i was said this issue was related to payment gateway. P.S. Have updated the article with safety/security/payments related info. Thanks for the update Siddharth. My payment of 25k got failed and I got the pop up saying ‘If money is debited from the bank account, refund will be done within 7 days’. Money got deducted. But there is no information about the failed transaction and refund status in the my app. What can I do? HDFC Jet Debit card has stopped giving miles I guess 🙁 Made transactions on Dec 20 & 22, but miles not credited until now. It was crediting until Dec 19. Has anyone received miles after Dec 23? They did not stop, but they’re taking longer than usual. These take it takes ~10 days to reflect, earlier it used to be within a week. I did txn after Dec 16 and still got points. Well, it appears that HDFC monitors high value txn on debit cards too, just like credit cards as someone other day said he didn’t get points for his high value car purchase. 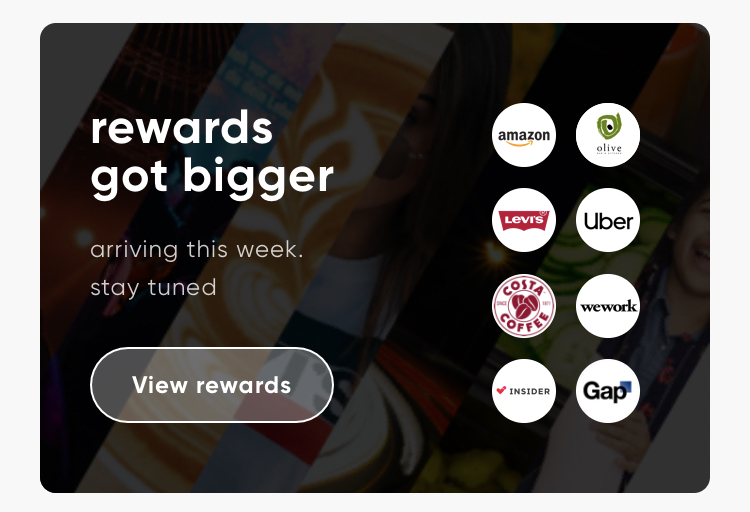 So they might be using different payment gateways and with one of the above Razor pay payment gateway, there seems to be some issue with reward points. Waiting to hear from IndusInd customer care. I have received jp miles for payments made on cred till 26th december on 2nd January. Running out of options now on how to burn the cred coins. 🙂 Ixigo 5k voucher is also gone. The remaining ones are not that attractive. Cred needs to bring in more reward options to get the charm going i guess. But anyway before cred we hardly imagined credit card payments will bring in some value as well. Cred has very few value for money rewards options other than Urbanclap as of now. However, I wrote to their team suggesting to bring in Uber and Zomato vouchers. To my surprise last week after making payment via CRED I got the option to burn coins to get Uber gift voucher and I happily took it. Its much more useful than many other options available currently. Amazon, Flipkart, Makemytrip, Yatra, Bigbasket. Guys please feel free to add more to above wish list. Hope to see Cred come up with these options soon. Is there any upper cap for Jet HDFC debit card, as like Jet ICICI Sapphiro card? My payment to cred failed on December 20th but the amount got debited from my bank. The customer support has claimed to have already sent the refund and they have given me 2 different reference numbers. My bank is unable to track either of the reference numbers. Now they have stopped live chat and moved to a ticket based system. I was supposed to get a reply from them to my ticket in 24 hours but they haven’t gotten back to me. I have emailed and tweeted Rahul about the issue. I am quite disappointed with their service. If they are slow in processing refunds, it is going to be a real problem for people who have tight cash flow. I will reply to this comment if I get any updates from them. Update on jan 5th – Rahul called me in an hour of emailing him and the matter was resolved. He acknowledged it was an internal issue that they should have detected earlier. I am happy that Rahul responded and tackled the issue quickly. I will continue using the app but they should improve their regular customer support channels. I made the paymet of yes bank credit card payment is deducted from my account but did not get confirmation still payment is neither credited in my yes bank card account nor reversal in bank account no way to talk with customer care to solve the problem i log the complaint throgh chatting option but no response got till now I am comfused what to do ??????????????? Appears that the issue has been solved now. P.S. Its safe to do the txn a week before due date. Nice app, but what’s the difference btwn this app and mobiwik app and cred same process where money would be in form of voucher on luck refund/reward would be received, wherein if u check phonepe and Google instant refund in bank account. Sir why do wait for luck instead believe in getting instant reward for Ur transaction. Cred is totally different from MobiKwik. Mobikwik and phonepe are wallets where as cred is a card payment app. U get points from payment which can be used to get vouchers. MobiKwik is the worst wallet of all and phonepe does not allow to load momey through credit card again a useless wallet. Paytm is the market leader and best and now they have started postpaid again and market first and killing feature. U can use it as a credit to make payments and clear dues later. Paytm Postpaid is for selected users only I think. Also not really market first – already have Lazypay, Simpl, PayLater etc being there. Today I redeemed an Urban Clap Rs 500 voucher, and got a Swedish massage at home. The price is 1099, so I had to do a 599 out of pocket expenditure. It was an hour long session and so rejuvinating. I have recently sign up for CRED app, but it is showing I am in waiting list and they will add me once more slot is available. Is anyone else is having same issue? My Experian Credit score is 779. Is it because of low score? Can anyone give away Urban clap voucher here? All my payments done for HSBC credit card is reversed, when I spoke to HSBC customer care they said that payments are not authorized or marked suspicious by HSBC and asked me to pay only through billdesk or NEFT or VISA CC payment. First time facing issue like bank won’t accept payments, due to above reason and don’t know how long it’ll take to get the reversed payment to source. I have raised ticket to CRED support, will see what they have to tell. Update: refund done within 1 day directly into account number given for refund via IMPS. Support team said within next bill payment, they will solve the issue with HSBC. Indeed interesting to note that HSBC has such strong controls. If you pay as multiple payments, it’s getting canceled by HSBC saying suspicious. This month my billed amount is 61K, I made as 20+20+20+1 on same day to get better killbill reward from CRED. Last month my HSBC bill amount is 57K, I made full payment in one transaction as suggested by CRED team still it’s declined by HSBC and CRED took ~10 days to refund the amount that too after several followups. Swiggy Super 12 months membership up for grabs for 15k points thats worth Rs.520 if we purchase 6, 3 months memberships. My 3 membership recently expired will take this. Its worth the money. Free deliveries, frequent discounts offered, no surge fee etc. It worked well. I also had purchased Swiggy Super 2 months back and was not able to see any option at that time. Noticed today that my previous membership is due to expire in 5 days, and one year membership was showing only for Rs. 1 (998 discount auto applied). While signing up for Cred, they pull the data from credit bureau. Does is it also mark an enquiry on Experian and Crif score? Hi Sid, thanks for this amazing article. I tried to pay using debit card, but I didn’t receive any additional points. I got points to amount paid only. Is there any other condition to get extra points from debit cards? The debit card points depend on offers as applicable on the debit card. Say for example, some cards give reward points only on specific merchant type – say departmental stores. And for same, they identify by MCC and decide points. Sid, pls send this to Anand, if u know his email I’d. Yatra 33% discount on hotel, if anyone needs YTCRD1D363MVJ0XA! Does anyone getting JP miles after Jan 01 for using HDFC Jet debit card? I have used 5 times after Jan 01, but didn’t get the miles credit? I have over 350000 cred points. I have moved to US now. If anyone need any voucher, I am happy to redeem and give for free. Very generous offer ankit. I would like to try the Man Company 1000 voucher. Could you please redeem that one and send the code to Sidharth? Sidharth if it is not too much trouble you could send it to my email. It would be great if you can redeem your points for swiggy super offer!!! Swiggy super offer can be activated only on the number registered on the CRED App. If Ankit activates the offer, It will be applicable on his number only. Do you have any Moms and co voucher? Or Tea Trunk? Can use them. Arun your Moms Co code is CRED500OPPI. Not sure this app is safe for using netbanking credentials. It saves/notes the userid and password while paying through iphone. It uses payu as their payment gateway but uses a lesser known “juspay” for hassle free payment experience. Also need to know their business model. How are they going to sustain? Rs 700 cashback for Card payment of Rs280000. Need to know more about their bussiness model! Update Jan 13 – Not receiving RP on IndusInd for transactionz marked as “PaymentsPayU Mumbai”! I didn’t get any reward points for “RAZ/CRED*404”, I remember getting reward points for PaymentsPayu. I think they might have registered themselves with all banks to remove the MDR rate since they are payment app. They can’t bear the MDR on Debit cards which is usually around 1%, hence they would have negotiated with banks to make it 0% and stop the rewards like government payments. Are you sure about it? Did you wait for few more days to check the reward points status, because sometime due to holidays, Reward point posting may be delayed. For me “RAZ/CRED*404” didn’t get any reward points, but payu did. @ Gagan – That post was in response to Sharathkumar Anbu’s January 9 post where he received points for the said merchant. We really can’t go merchant code hunting now to ascertain which payment protocol CRED would be following for its payments! @Shivi Ah, ok, was not clear from post. Indeed we can’t go MCC hunting and anyways that is not in our hand – it keeps on changing. I have seen CRED, Dreamplug, PayU, PaymentsPayU etc etc on consecutive payments. But the point is to see if we really get Reward Points and on which cards. I too got this card last week – it First Year Free (FYF) – guess will get this cancelled then after few days! No such reference in HDFC website. I received miles for all payments made till now. Last payment was made on 7th January. Yesterday they have posted a threshold bonus of 1000 miles. Had received a threshold bonus of 1500 miles last month also. I received 5187 miles when I paid 3,90,000 with my Jp HDFC debit card on Jan 11. May be things changed after that. Please do keep us posted. I have a couple of big payments to make on my cc over the next week. This was the note in statement RAZ*CRED, 404, U POS DEBIT. I didn’t get reward points in IndusInd when the statement said “RAZ*CRED, 404, U POS DEBIT”. I raised a ticket to check on it. They called and told me that those transactions are not eligible for reward points. They kept saying that this payment gateway is not eligible for reward points like that. Only exclusion in IndusInd was for government payments and mutual funds but the lady who talked kept saying the payment gate way is not eligible. I asked it is not written in the website and how do you make such claim, She repeated the same and not ready to listen whatever kind of doubts we ask. I am getting confused how payment gateways matter. If the say Merchant code or something, It will make some sense atleast. Same thing happened with me Anbu; the latest payment round to CRED via RazorPay is not eligible for IndusInd Exclusive RP. And there is no way of finding out which payment gateway will be used when you make payment to CRED. I’ll shift to DCB Debit card next month onwards. I received miles for payment made on 23.01.2019 too. Do we receive JP miles with HDFC JetPrivilege Debit card for adding money in Phonepe? Today did some 8 payments transactions and thought of sharing observations with you. Any benefit of making payment from SBI or ICICI debit cards? DBS has stopped their digibucks rewards program so looking for an alternative. Where did you see the information about digibucks being discontinued? Digibucks programme started again. You can get the info from their website. If I make 5 transactions of 20001 INR from digibank debit card, is there a capping to get max total of 600 digibucks. Will I be getting 600 * 5 = 3000 digibucks. Can anyone please confirm on this? You will only get 600 digibucks. Has anyone redeemed the stylecracker voucher yet? In the t&c it is mentioned that is is valid on 4999 box however on the stylecracker website there is no 4999 box. The closest is 5499 box. No Kill the Bill rewards coming now after I have installed the update in Iphone. Is it the same in old versions as well? Has cred stopped giving Kill the bill vouchers ? i paid 15k 2 times today. didnt get any voucher (either 1k or 10k) to burn. May be they have run out of cash to burn ! Did you updated the app in Iphone? Or it is coming in older version as well? I paid 25k today. I got two kill the bill vouchers. 1 for 1000c and another for 15000C. I am using lastest version. I tried today with updated app and still it’s working when I go into reward section, but didn’t get notification for Killthebill like before. FYI, at per cred TnCs only 300 mystery reward per user. Guys, for those of you who have loads of cred points to burn before they expire, you have an option to sponsor a meal. Lets join the “mission 10 million meals”. i always do philanthropy to people around me, where i can see things happening & never donate to any organisation. As you’ve mentioned food, i donate food to beggars in my place (sometimes, people passing-by also ask for the food) , give food to children & old age homes around me, 90% of the time food is prepared in my home for donations. To date i’ve never gave re.1 or rs.5 donation which are asked sometimes in mc.donalds, amazon, bookmyshow, horlicks, adani, malls, theatres, etc.., & to students who are doing social studies. i like to water a plant which i can see everyday, to see it grow, flower, fruit, give shadows to lives, to see it having nests. its a joy which your can never & ever get when you donate to a organisation which dont do work in front of you. Being a benefit sucker of cards, why should i leave out the joy which i cannot get by donating to faceless organaisation. Indeed, especially when it costs nothing out of the pocket! Anyone has an unused MarQ voucher that he/she doesn’t plan to use? I get 10k Kill the Bill on payments above 20K … How much do you have to pay to get Kill the Bill 30k? I think u get 30k on paying above 50k. One person can burn coins only 300 times for cash. Interesting, observed that Cred is now able to remind of Amex bill too. Wondering how are they able to do same? Can anybody help me with bombay shirt company coupon? I use to pay Rs. 1,000 to credit card in one go so that I can get 1 chance to burn 1000 points. When I burn 1000 points I get anywhere between Rs. 7 to Rs. 1,000. But now whenver I pay Rs. 1,000 as credit card bill I am not getting any option to burn 1000 points for cash because I have burned 1000 points for the maximum allowed number of transactions which is 300. I request cred member to clarify on above comments..I have not seen any terms/conditions on cred FAQ. It seems in the newly issued HDFC Jet Privilege Debit cards – there is an exclusion for getting points on ‘Business Services’. Maybe card payments via CRED is classified as Business Services and that is why we are not getting points. I did not get any points/miles for payments over 70k made in Jan. I too opted HDFC Jet Debit card a month back. Did make payments on CRED but didn’t got any miles for paying. Have anyone tried to pay axis credit card through cred in the recent past? I tried last week and it’s instantly credited through IMPS. Siddharth please let us know whether HDFC Jet Debit card have stopped giving miles for Cred transactions? I just got the card and need to know whether to transact or not? Axis Priority card (Priority Account), DCB Cashback card (Elite Account) and CitiGold World Card (CitiGold Account), SBI Gold card (Any SBI account variant) are giving points for now. IndusInd Bank Exclusive Account linked Visa “Signature” and MasterCard “World” stopped giving it in January 2019. Are you sure Citi World Card gives points? Is the eligibility mentioned in their site followed strictly? I received CRED payment points for the month of December in January for sure. Not much payment in January so I’ll update you next when my RP are credited for Feb transactions in March. Thanks Shivji, please let me know What is the reward value we get in Citigold World Debit card? Can someone say after how many days I can find the JP miles on the HDFC Jet debit card. No text from JPP team or anything in HDFC portal. Using it since late Dec on Cred , is HDFC allowing accrual of miles or not on this transactions. How about Axis Burgundy debit card? What’s the reward points per 100 in SBI debit card? Used HDFC Jet debit card on 2-3 apps including Cred but have not received JP miles accrual message. Neither can see anything under Pending Activity in JetAirways website. Can someone suggest how much time does it take to reflect or get a communication about the accrual? Also which is the customer support team to reach out to for Jet Airways cobranded cards(for JP miles accrual queries)? Bank or Jetprivilege customer care number? It used to be 7 days before but now they’re taking 2-3 weeks or even more at times. I upgraded to JetPrivilege debit card. Have not received any miles yet even for payments made in Dec. Called up the customer care and lodged a complaint. They might have stopped it. Will post back when I hear from the customer care. I also have a SBI basic account. I understand that I’m eligible to upgrade to Wealth account that gives me SBI Signature debit card. According to the points structure on SBI rewards website, SBI wealth debit cards get 10 pts per every 200 spent. Each point is 0.25p, so a good 1.25% reward rate. I have applied for upgrade. Same here. No miles so far on the hdfc jet debit card. Haven’t lodged any complaint though. Pls post back if you hear anything. Ok, things happened after I lodged a complaint. I got a call from my RM after a day and he said the ticket is being closed and he is personally working on it. I got a big chunk of miles credited into my JP account yesterday with the narration – HDFC JP debit card usage and some threshold bonus. Quite inconsistent policies. I’ve applied for SBI upgrade and it seems to be pretty straight forward. Today they added Levi’s gift card worth Rs. 2k redeemable on 100k cred points. Seems to be a better deal than the meagre amount of cashback we get nowadays on using the scratch cards! Take it before it goes away! Its not a good deal. Levis product are always available for 50% discount. In 2 k u can get a decent tshirt but not jeans. The voucher is applicable on MRP and not discounted products. I am giving it a pass. Also uber voucher has come up take it before it goes again. Its written cannot be combined with other store offers. I have till now earned 757699 coins and have burned 5,97.018. Similary in my wife account i have earned aroun 2.5L coins. Gap voucher has also come up. The restaurant vouchers very good like Soda Bottle opener Wala Rs.1000 voucher for 50K points. Anyways if people are sitting on heaps of points it makes sense. It is just a payment option. You can use along with store offers, if any. Nothing is mentioned regarding this in the T&C. Had it been the case, it would have been mentioned there, similar to the ‘The Man’s Company’ voucher. AFAIK, SBI debit cards – I Hold Gold and Platinum Variants – and Axis Bank Priority Debit Card are still giving points on the CRED payments. I can’t for sure say the same for DCB Cashback debit card as the cashback is posted after the end of quarter which means eligible cashback for Jan, Feb and March, if any, will be posted in the 1st week of April. I hold a SBI Pride Business Debit Card and I’m earning reward points on my credit card payments on CRED. Yes.I got 150 uber voucher for 10k points but Levis 2000 voucher is for 100000 points .Even Gap 1000 voucher for 75000. Amazon voucher have come for 15k points. Got Rs250 and rs.200 gift card. Wish they would add a single /quarterly /yearly subscription to CIBIL or Experian report as a reward someday. That would be a killer deal! Thanks, Mahendra. We get only an Experian credit score on the site mentioned by you. I was referring to a full-fledged report for download & analysis. Amazon voucher is in live. I got Rs.250 voucher. After trying for more than 30 minutes finally I got 2 amazon vouchers of Rs. 200 each. Congratulations Sid. CRED provided this review on the app. You are a star. Needless to say, everyone here owes you for creating such awareness and providing fun using credit cards. I deposited 40000 to my card. On 1st match 2019… On 2nd March status of payment is success and credited to card on android app…but actually there is no amount reflected on my credit card…..kindly resolve this… chat support is also not replying.. I am using this app since two months now and I have paid my credit card bills for around 2 lakhs . Such an awesome app you get points for what you spend . From two months I have redeemed so many offers and big thanks to CRED for this lovely app .. just some time back I have donated for give India all my points thanks for this wonderful initiative.. However no response from kunal.. Which isn’t the case with other founder CEO, who quickly respond to issues on tweets. So somehow this first issue in redemption and their casual attitude including founder, makes me think very cautiously about what to expect from them. DJ SNAKE passes are available. Hurry up! Two passes can be had in single redemption. Downside is, its not transferable! Any specific reason my last comment on CRED wasn’t published. I don’t think you are knowingly blocking a comment about issue faced on CRED app? I try my best to keep the comments unique & useful for others. When its not, especially on threads with too many comments already, i tend to skip. Anyway, got it approved for now! I’m not sure if this question has been asked before but has anyone received more than ₹1000 cashback on the redemption of a single mystery reward card? It used to till December 2018. I got CB of INR 980/-. They stopped giving points after Jan 2019! Mentioned the same is one of the replies above. I’d like to convey thanks from bottom of my heart to this wonderful blog. Thank you…….. Sid. The credit goes to you only. Wow – 5k is awesome. Congrats! I’m using SBI platinum rupay debit card on CRED app. I get 2 reward points for Rs. 100 which is equivalent to 0.5%. The reward points can be redeemed in form of Amazon voucher. Hi Siddharth, very useful information. Any confirmatuon on which debit cards still provide reward points for CC payments via Cred. Thanks in advance. Yes. Check on SBI Rewardz site and see how many points corresponding to the amount spent. There are a few other variables also for using the card more number of times/ crossing certain threshold of transactions/ money spent. Do we get points for doing on Citi Priority/ Citi Gold Debit card? I did not get points on CiTi Gold debit card. The points I received in the month of January (and mentioned by me earlier) were accrued for the month of December ~ Christmas time promotional offer. So, CiTi is out in the CRED run. Havent got any rewards on SBI Wealth Debit Card. Did several transactions for 100K+. Has been already a week now. Do we need to wait more. You will get points for SBI Wealth Debit Card. However it will be posted after a month only. You also will get quarterly bonus points. 5 points for Rs 200 normal and 1 point (or is it 2 points) as bonus. So about 6/7 points for every Rs 200. There is no cap on points. DO U get JP Miles every month on Month I have to follow up for 2 months to get only 2 months points. Hi.. I downloaded the app and registered etc. But when I went back to the App to pay my bill, it’s asking me to verify my identity using a 4-digit numerical code. There are no other instructions. I seem to have only 10 attempts. And no clue how to go about it. Please help..
Must be your mobile unclock code. This has been phenomenal. I got Raymond (1200 off from 10000 coins, no TnC), Insider.in (250 from 15000 coins), cult.fit membership for a month (25000 coins) and a big basket coupon (1 free on purchase of 1 premium juice – I forgot name). What can be asked more. Its not that these things are costly buy CRED allows you to explore (at free of cost) before you can do big shopping. I also had a free coffee at Costa, BMS, Swiggy Super etc.. The list is long. I sincerely thank Card Expert blogs to be enable to use resources available to us. I stopped playing “Kill the bill” as attractive coupons come in limited quantity. Bingo. Jio mere lal. Keep posting. You rock Sid. Actually I’m unsure if any bank has stopped giving points targeting CRED per se. If the merchant name is “CRED”, it goes through some different payment processor which doesn’t fetch points. If merchant name is PaymentsPayU then you get points. I got points this month on HDFC Jet just fine. I realized this when I did not get points for one payment made by Citi card last month, and the merchant name is “CRED”. All other Citi payments, including one after the instance has “PaymentsPayU”. Now what I do is — keep trying until I get right payment processor. Since Citi OTP SMS shows name of merchant, I know beforehand if I’ll get cash or not. So we get points for doing on Citi Gold Debit card if the merchant is “PaymentsPayU”? Yes. A whopping 2% cash! Citi makes it very hard to track those, check your statement carefully. I usually send a redemption message for each payment I make (If I make a 50K payment, I’ll try redeeming 1K points), and have received cash for PaymentsPayU without fail. Not seeing it on any of my cards. They always NEFT the next hour. What cards do you use? Cred has a new feature now, “CRED GEM”. Apparently, Each successful referral will earn you a special GEM. You can use these GEMs the same way as CRED coins. I am able to see new cred balance i.e., cred gem balance. Anyone has any idea about it? No info provided in help section also. How it is different from cred coin balance? I got 2162rs by burning coin on 02 April but it still not credited on my card. Anyone face this issue. And How to contact them related to this. Is there any problem with citi credit card .. I have made payment of 7500 last month but it is not credited in card yet and I am struggling for refund. Referrals now active in cred app. For each successful reference we will get 10gems. There is separate coupons for gems to redeem. Hello Rohit. 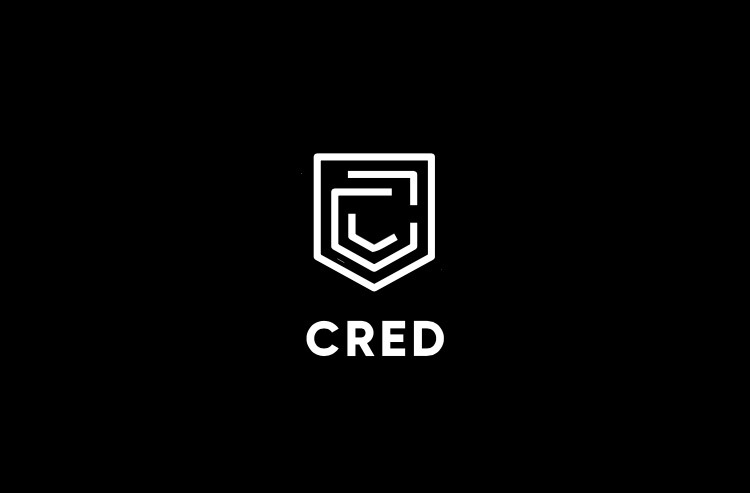 IAM one of the big fan of cred app. Really awesome features. I have one doubt. Please clear it. I paid 75k bill and got 75k coins. I redeemed 10k and 10k gift vochers . Shall I use 2 vochers in one product. Got 2*750 amazon gift card on burning gems. Seems more redemption option to come on gems. Recently my friend referred his father to CRED and added his unused credit card (last used a year back). After some time, he started to see fraudulent online transactions on the card all at 15-20 mins interval. He immediately blocked the card and raised a dispute. Now, he just registered the card, did not give any email permissions and yet this breach of security. Should we be alarmed ? Is CRED secure ? Probably a co-incidence. They don’t take expiry date & CVV.